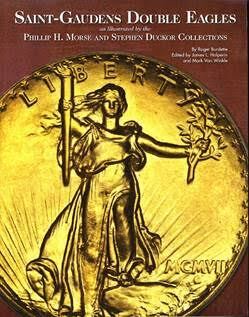 The definitive resource on the history of one of the world's most popular collector coins, Saint-Gaudens Double Eagles as Illustrated by the Phillip H. Morse and Steven Duckor Collections, written by Roger Burdette and edited by Heritage Auctions Co-Chairman Jim Halperin and U.S. Coins Chief Cataloger Mark Van Winkle, is now available through the firm's website, HA.com. Widely accepted as the most detailed resource ever compiled about these popular coins, the book covers every die variety available to Burdette, a multiple winner of the Numismatic Literary Guild (NLG) Book of the Year Award. "The amount of research and expertise that went into this book is extraordinary, and is the reason this is as complete a resource as there is about Saint-Gaudens Double Eagles," Halperin said. "Roger Burdette and the Heritage Auctions staff who worked on it are unquestioned authorities on the coin and its history, making this a must-have resource for these coins." Each issue details the estimated number of examples available to collectors, starting with the mintage. That total is pared down based on the number known to have been destroyed by the Annual Assay Commission, how many are believed to have been shipped overseas and how many are estimated to have been melted after 1933. In the cases when it is available, the delivery schedule also is included. Also included are coin details like the number of dies used to strike each issue, date and monogram placement and mintmark placement. Each issue includes an extensive commentary section, as well as a list of exceptional specimens. One exceptional resource in the book is the collection of multi-page sections that cover specific groups of coins. Among the groups studied are Double Eagle Shipments Between the U.S. and Europe as well as Central and South America, 1906-1907 Patterns, the Gold Standard (1907-1913), the controversial status of proof 1907 High Reliefs, World War I and Gold Exchange Suspension (1914-1919), post-war production (1920-1929), America's Last Circulating Gold Coins (1930-1933), and the Manufacture of Proof Saint-Gaudens twenties. There also is an in-depth comparison of the die characteristics of the two 1933 twenties in the Smithsonian and the 10 Langbord coins currently in Fort Knox. The 648-page book sells for $95. Yesterday morning I received this release by email from Heritage Public Relations Specialist Steve Lansdale, who added, "... your copy of the book is supposed to arrive today." Not more than six minutes later a FedEx driver was dropping a package at our door. The internet is getting a little creepy these days, but progress is progress. The package was a heavy one. The softcover book is printed on glossy stock, and those 648 pages weigh a lot. The 12-page opening Background section provides a great overview of the international flow of gold coins and the accuracy of gold coin, bullion and Treasury reports. Chapter One is short (but one of my favorites), covering the patterns and experiments of 1906-1907 and the President's "Genesis" letter on White House stationary. Short and to the point, Theodore Roosevelt asks, "I think our coinage is artistically of atrocious hideousness. Would it be possible, without asking the permission of Congress, to employ a man like St. Gaudens to give us a coinage that would have some beauty?" The bulk of the book's chapters are devoted to individual date and mintmark issues, illustrated with wonderful full color photos of high grade specimens with high resolution images of design details identifying notable die varieties. But these chapters are not mere recitations of minutia - the narratives tell the story of each coin with relevant information and commentary from government documents and numismatic publications and personalities. Each could be an interesting standalone monograph in its own right, as would the essays that divide major sections - these have a lot of information of the distribution, use and role of American gold in international commerce. I particularly enjoyed the early chapters on the high relief and ultra high relief patterns and the presentation of information and details on all the known specimens of the 1933 Double Eagles. I understand the book took over five years to research, a year to write and was actively reviewed and "field tested" for another three years.